I usually do my food and recipe blog every Friday or Saturday but this past couple days has been super busy for me. The schedule between work and home is just so hectic, but I just want to let all my lovely readers and visitors know that I read all your sweet comments, Thank you so much!. By the way,I'm back! 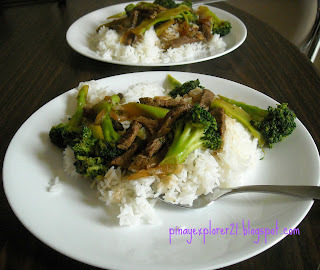 hehehe with another delicious recipe, this Beef with Broccoli recipe is kinda like my " to go " meal for busy day. It is very easy and quick to make, we are talking like less than 15 minutes..wink! which is perfect recipe for busy day. I do love to do take out sometimes but there's some days that I just love to cook for my family, I just simply LOVE the aroma, the sizzling noise just simply love cooking. What is your favorite to go meal for busy day? Do you love broccoli as much as I do? If YES! this recipe is for you my friend. The cooking process is like 15 minutes and your done! You can totally make your own twist by substituting broccoli with your favorite vegetables or whatever you have on hand is totally fine. I love simple sauces like soy sauce and beef stock but I've seen broccoli and beef sauce mix at grocery store the other day. Its a good thing to know! Yay! C'mon join me in my kitchen and lets make a fast delicious dinner for the whole family. Yum! - Adjust the recipe for larger crowd. - Broccoli and Beef sauce mix is available in the market now but you can totally do soy sauce and beef stock if you want. - Subsitute broccoli with your favorite vegetables or whaever in your hand is totally fine. -Taste according to your preference. 1.) Marinate the sliced with little soy sauce. Set aside. 2.) Meanwhile, in large pan put little oil wait until it heat through then add the marinated beef. 3.) Once the beef is cooked. Add the onion saute for couple minutes. Add the broccoli. 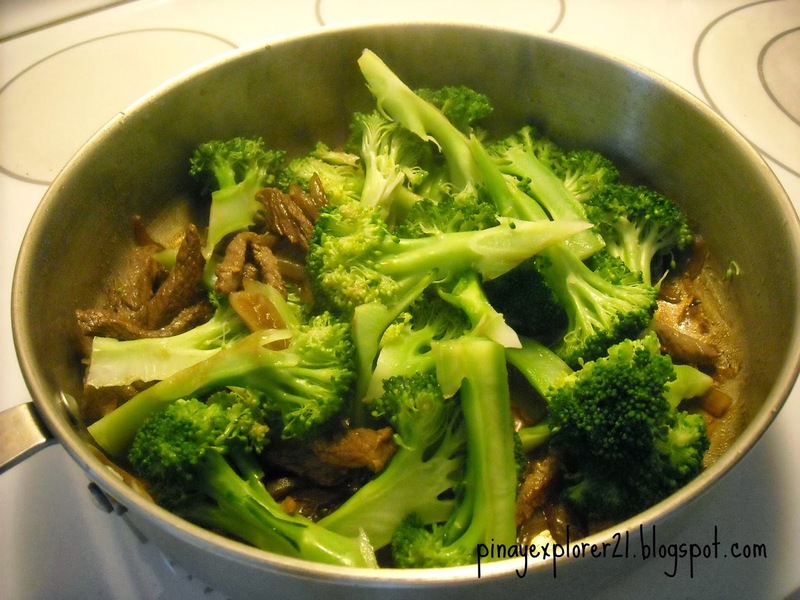 *If you have the beef and broccoli sauce mix this the perfect time to add it to the pan, If you don't little soy sauce and beef stock will do. 4.) Add your favorite sauce or in this case I add little soy sauce and beef stock. Let it simmer until everything is cook. Salt and Pepper to taste. DONE! I told you its a quick fix meal and I hope you'll be inspired enough to make this one of this day, kinda like your to go meal on busy day. To my lovely readers and visitor of this blog. Thank you so much for keep coming back and I hope you like all the recipe that I posted. Till next time for more scrumptious recipes. Have great day ahead everyone! sounds and looks so delicious, thanks for sharing! Our go-to beef dish is beef with mushroom naman. 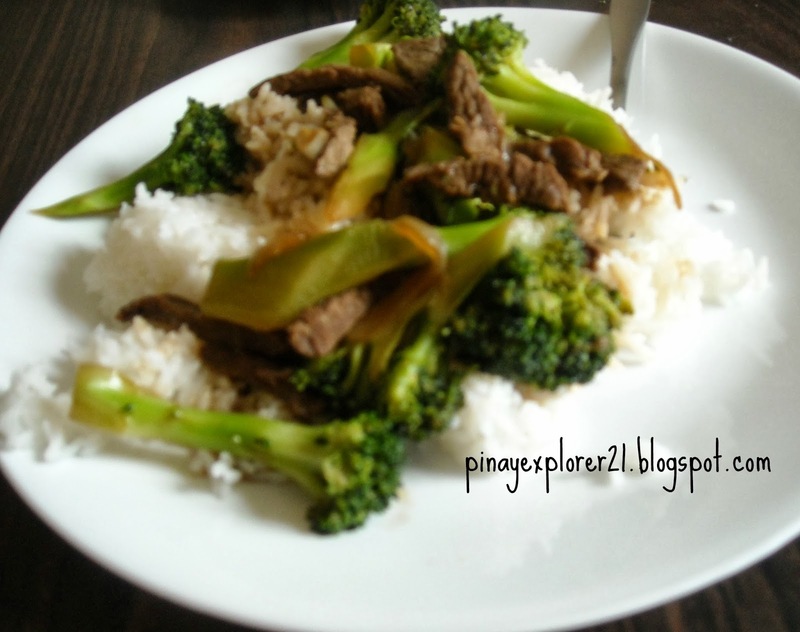 It's so yummy and easy to timpla, although we have to boil the beef until tender. I can also make a simple beef soup with potatoes for my son who doesn't fancy mushrooms or beef. I blanch the broccoli in my case. Mas gusto ko yung hindi na siya crispy at na mix na sa sauce. Yum pa rin for this! I love broccoli. I love to make this since it is very simple but I used pork instead of beef. Its still really good! :) same here I'm broccoli fanatic:) Thanks! First of all, I love Beef with Broccoli! Thanks for sharing! This is one of the favorite type of dishes of my kids but I use chicken and oyster sauce instead. We're just not very fond of red meat. 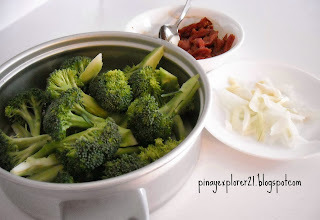 Daddy always cook pork with broccoli naman since I don't eat beef. It's so yummy no? It is really good Maye, pork is really good too:) Thanks! This really makes me hungry right now. I love both broccoli and beef.